by Christian Beaudoin and Julia Georgules — Originally published in the January/February 2017 issue of BOMA Magazine — Recent media coverage may have you thinking that the shared office concept, often referred to as “coworking,” is a new commercial real estate niche shaking up the traditional office leasing model. But short-term leases and flexible size arrangements date back to the 1960s. Since that time, the industry has grown to include major players, such as Regus, Carr Workplaces and Servcorp, but local operators also have proliferated across the United States. The trajectory of the shared office industry hasn’t always been upward, however, with fluctuations occurring during times of economic contraction, as well as through mergers, acquisitions and failures. As a result, the value proposition of this business model has not always been apparent to landlords who depend on reliable credit tenants to maintain positive cash flow at their buildings. Following the last recession, building owners were hesitant to lease to shared office providers whose business models were based on speculative tenant demand. With a glut of sublease space placing pressure on a down market, it wasn’t obvious that the risk would pay off in the near term. Additionally, many tenants were offering to share a portion of their own space. (Since then, companies like Liquid Space and Pivot Desk have emerged as a service for tenants with excess office space.) Needless to say, the options for tenants were plentiful. But like so many businesses in recent years, the shared office industry has been disrupted by innovation. This innovation has come from the full-scale adoption of broader workplace trends focused on collaboration and creativity, as well as flexibility, mobility and wellness. Simply put, the recent, rapid growth of coworking is driven by tenant demand for choice and user experience. The coworking experience can be achieved through many brands and locations, depending on individual or business needs. As of mid-year 2016, the industry in the United States totaled more than 27 million square feet across more than 1,400 locations. However, while this may sound large, it represents less than one percent of the U.S. office market. 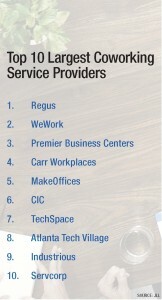 Of the top companies in this space, Regus remains by-and-large the biggest competitor, occupying more than 17 million square feet. 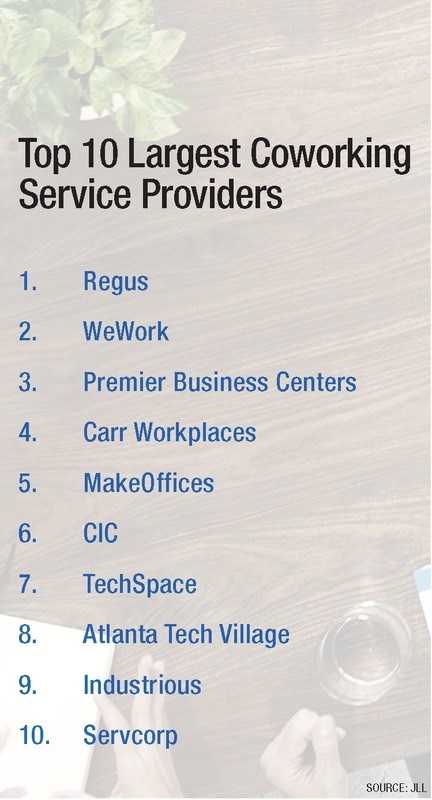 In fact, from 2013 to 2016, Regus doubled from 1,500 to 3,000 locations, opening both traditional Regus Business Centers as well as its new brand, Spaces, which caters more exclusively to the coworking contingent. Following Regus—and growing rapidly—is well-known coworking provider WeWork, which leases and operates more than five million square feet nationally. In Q3 2016, JLL recorded nine WeWork lease transactions, four of which were new-to-market locations, while the others were expansions into existing markets. For reference, over the past two years, WeWork has signed the most office lease transactions of any company that JLL tracks (leasing 20,000 square feet or more) for a total of 46 lease transactions. The second highest lease-transacting company? Regus, with 40 leases. The numbers decline rapidly from there, with Comcast signing 22 leases, followed by Bank of America (21) and Morgan Stanley (20). Even within the technology industry, which accounts for the largest share of office expansion, the numbers aren’t that large. Google, for example, completed 14 significant lease transactions in the past two years. Who’s Coworking and Who’s Not? If the rate at which coworking companies are expanding wasn’t impressive enough, the increase in brand recognition and the general awareness of this industry should have building owners and property managers thinking critically about what this means for the commercial real estate world. In today’s shared office space, you not only will find traditional users, such as freelancers, independent contractors and small businesses, but you’ll also find virtually everyone else. Tech startups have become the power users of the coworking model, establishing private offices for their growing companies, while large corporations have opted to set up more permanent locations within coworking companies to provide alternative workplaces for their employees for convenience and mobility. The trend of corporate coworking does not appear to be a passing fad. According to workspace specialist Instant Group, a corporation’s flexible office portfolio can comprise as much as 25 percent of its total leased footprint. That’s not insignificant. Mobility and flexibility are two of the top selling points driving demand in this market, and it’s an issue that traditional landlords have been grappling with throughout this cycle. Because of this—and supported by strong demand—the coworking industry is no longer viewed as a risky bet, but as a large-block tenant and an added building amenity. With expansionary leasing activity being driven most significantly by tech companies, followed distantly by banks and financial services, the coworking industry represents a critical growth sector that’s leasing office space. Specialization. As the coworking model evolves from a fringe option to a fully established segment of the real estatelandscape, the degree of specialization should increase as providers seek to differentiate their offerings. Some of the most interesting new coworking spaces are those tailored to specific industries and target users. Hera Hub, for example, is a coworking provider for female entrepreneurs and women-owned businesses. Another venture, MHub, is focused entirely on product development and offers spaces and programs dedicated to manufacturing innovation. These examples follow the logic that one size (or one model) does not fit all coworking users. They also highlight the demand among members to collaborate with professionals who have similar interests and goals. Specialization could further assist coworking providers in an economic downturn. While a generic shared workspace may be able to attract users in a growing economy, it will take a model that is compelling and unique to retain members in the event of a recession. Consolidation. Today, the shared workspace market is highly fragmented and there are literally thousands of providers. 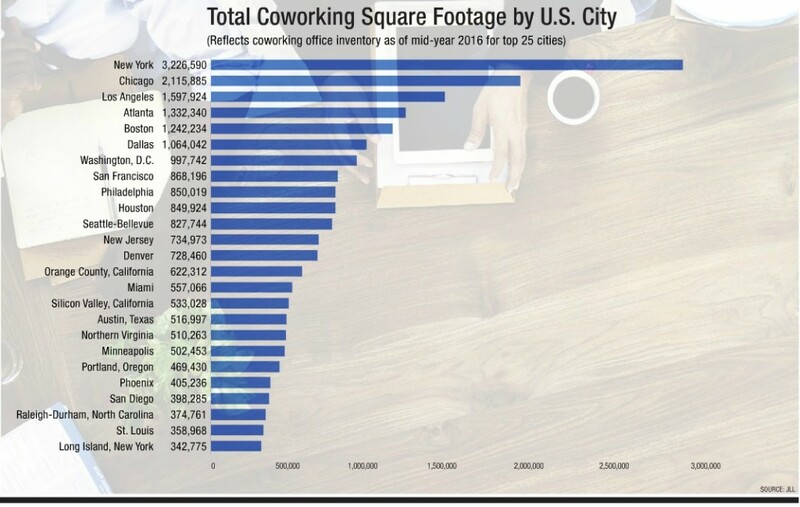 In Chicago alone, JLL has tracked more than 100 unique coworking locations operated by more than 60 different providers. As the shared workspace market matures, it is likely to follow the natural progression of other industries. This implies that, after a period of rapid growth, the weakest providers will be culled from the market and consolidation of other players is likely. Over the next several years, some of the largest coworking companies likely will absorb smaller competitors and seek new market entry or competitive advantage through acquisition. As with airline or hotel mergers, the combined coworking brands will need to focus heavily on member loyalty and retention, and not just cost-saving opportunities or market share. Globalization. Just as most industries now operate across borders, coworking will continue to expand globally over the next several years. As of mid-year 2016, JLL had tracked a total of 7,800 coworking spaces globally. In 2010, there were only 600. This incredible growth trajectory is expected to continue through 2017, with significant opportunity for expansion in Asia. Coworking has a unique advantage in emerging markets, where lease terms are more complicated and real estate transparency may be lacking. Rather than spending months in site selection and negotiations, companies can establish a presence in a coworking facility in a new market and be up and running with a team in a matter of days. This advantage is multiplied for global coworking providers that can offer consistent services and amenities to their members in Boston or Beijing. Changes in the workplace landscape, influenced by a shift in perspectives on everything from flexibility and convenience to design and experience, have been a boon to the shared office industry. No longer viewed as a secondary office space provider, coworking operators have become essential services for a growing segment of the professional workforce. In some cases, they have even become competitive with landlords, capturing tenant demand that may have otherwise leased directly with an office building. The competitive edge that these companies have been able to develop in recent years may feel like a scary prospect for traditional building operators vying for what are increasingly discerning tenants. However, the potential risks are far lower than the potential opportunity. Successful coworking companies have figured out a formula for thoughtfully creating workspaces that have both speed to market and appeal to the masses. Now, landlords can view the coworking business model as a strategic play by filling what may have been challenging vacancies in older building stock, while also increasing the amenity base of their building. And, while some of the newer shared workspace providers have not been tested during a period of economic contraction, the overall coworking business model has been strengthened through broader awareness and brand recognition. The game has already changed for building owners. Due to increasingly sophisticated technology, work no longer is confined to a single location. Office tenants—from startups to major corporations—now demand workspaces that are flexible, collaborative and engaging. Coworking providers have met this demand directly, and they are now a critical component of the marketplace. Certain shared workspace companies may rise or fall depending on the economy and their specific offerings, but coworking will remain an industry to watch, because it is here to stay. ABOUT THE AUTHORS: Julia Georgules is a vice president and director of Research for JLL, based in Boston. In her role, she leads research programs for JLL across the United States and has expertise in leasing trends and occupier dynamics within the U.S. office market. Christian Beaudoin is director of Research & Strategy for JLL, based in Chicago. He has a broad range of experience in all aspects of the real estate life cycle, from design and development to acquisition, management and disposition. Learn more about JLL at www.jll.com.